Home > People > Land Occupants evacuated by Corporate Developers on Von Willich in Centurion. As commercial development booms in the country, admiring the beautiful edifices and creations of civilizations erected are some of the promises of a civilized and growing economy. In a country that has many displaced citizens and a population with uneven distribution of wealth, squatter camps have become part of the landscape in the country. Homelessness and an inability to earn a minimum wage are some of the factors of displaced citizens setting up squatter camps, many of the occupants of these camps work in industries with unregulated wage systems. 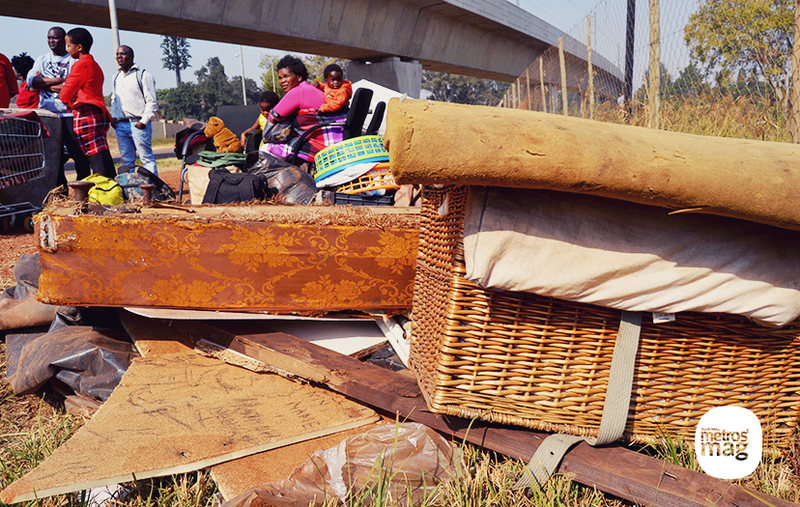 Corporate giants and property investors, as well as residents in the metropolis, believe the presence of squatter camps are a sure indicator of crime. As these camps become a breeding ground for crime and illegal activities. These claims are also ascribed to the depreciation of property values and a dirty environment that reduces the share interest or investment of investors, so in order to protect investments, these squatter camps are removed. Community members speaking to the displaced people to assist and advice them on what to do. Nobisi Mathapelo, a legal representative for MillionsWorth is one of the few that believes the growing presence of squatter camps in the country is an indicator of an obvious gap in the economy. She says the government should ensure that unused lands are fenced and that abandoned properties guarded. In a more developmental approach, the government can ensure the provision of public housing that has a balanced distribution agenda. A traumatized mother with her two children in the scouching sun with no clue of what to do. Abland – Corporate Developer reports in the news have claims in 2014 of halting of plans to develop their property due to the company’s struggles to get tenants as a result of the illegal squatters and their reasons are based on reports previously about the area being a hive of criminal activities and that neighbouring complex were being affected by crime. Our effort to reach Hendrick van Zyl of Abland was unsuccessful, the police officers on site of the evacuation were very hostile and the private security company (PRSS Prof Risk Security Services) that was involved in the evacuation process were very unprofessional to involve dogs in an operation that involves humans and not a drug or substance-related situation. 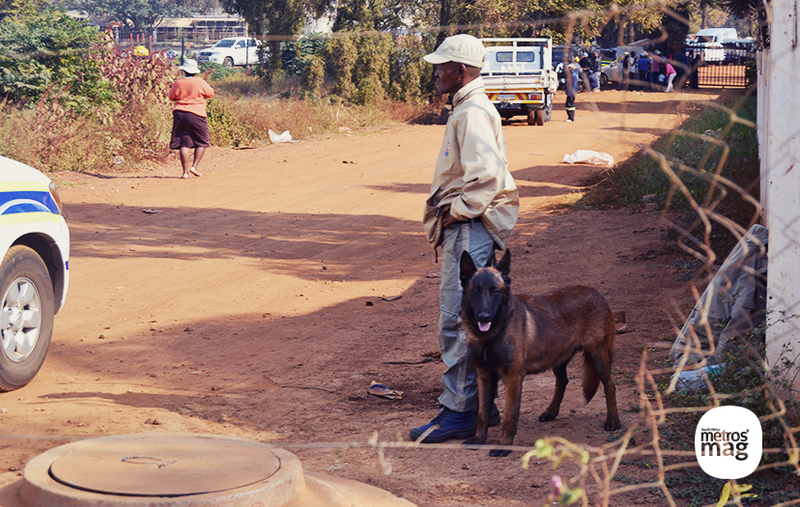 PRSS Prof Risk Security Services guard with a guard dog at the main gate to the Land area. The Land occupants made claims they had nowhere to go and in a meeting that was held with Abland, an agreement was reached by Abland to help these displaced individuals with skills development and remuneration to assist with migrating them from the land occupied. A construction worker and a disabled man leaves after they receive the compensation fee from Abland. The agreement amongst both parties were not documented, but the agreement was reached collectively, which was one of the reasons they stayed and waited for Abland to make good on their promises. This year Abland offered an undocumented fee to these occupants to leave the land and failed to fulfill their promises of skills development as agreed with these people. ” I am very sad that properties are becoming more important than people, we were promised skills and development, so we can all move away from here. Who wants to live in a bush all their life? No one,” says Mary Sibande, one of the displaced people. Many of these people believe those in the grass-root are ignored and never considered in the country’s developmental agenda, claims of SAPS officers refusing to offer them assistance on several occasions because they were in a squatter camp in centurion is on a regular basis. So Abland is unfair to offer us money to leave. We have nothing and nowhere to go, we would start another squatter camp elsewhere and that is not fair. There was a group that came and took our names from Abland and what profession, we need help with and I wanted to be a hairdresser, that is all i want not money” – says another individual amongst the people displaced. 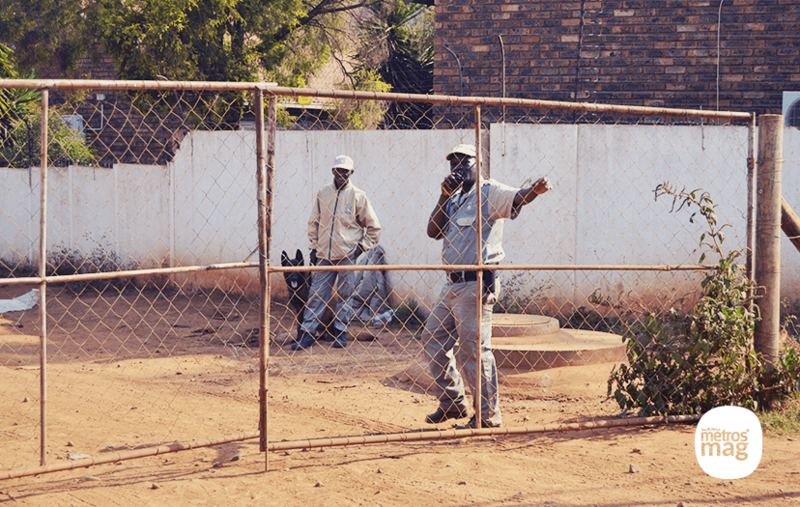 PRSS Prof Risk Security Services officers controlling movement in sight of a guard dog. The occupants claimed they have been on the land since 2005, since the construction boom started in centurion, and that Abland was aware of this situation which led to the meeting that was held to reach a resolve. We verified on Google Map indicator and according to Google maps there has been the activities of dwellers on the land since 2009, which proves this occupation of land, was not a recent activity, neither one steered by the recent EFF land occupancy revolt. Contrary to the opinion raised about the crime uprising and the claims from residents in the area, many of the displaced people were offered assistance from residents in the area, food parcels, temporary accommodation and promise of jobs. In times of harsh realities and an event that could leave many vulnerable to the plough of a declining social economy, it is overwhelming to see metropolitans stand for one another. Abland's development plan saves the day. SAPS confirms arrests and deaths in KZN Attack.